Concern Infotech - Who we are? Concern Infotech was launched in 2000 on the strength of an outsourced project called "Founder's Camp". This was a website carrying news of the IT industry at the that time which was booming, dotcoms were being made and bought at enormous amounts of money. Everyone wanted to dip their fingers in the startup pie. Venture funding and angel funding was at its peak. The website carried news about investors and about companies that had got funded. Soon the website started carrying news of layoffs and cut-downs culminating in the tragic Dotcom Bust. Being and outsourced project from the USA, we were soon out of business as we were no longer required to maintain and update the website. Concern Infotech was almost closed and our CEO even joined another company as Project Manager after a hiatus. The company she worked for inspired her to start her own portal called "thisismyindia.com". She quit her job, hired a couple of colleagues after sometime and restarted concern Infotech from her home. Slowly but surely we started with outside projects and established ourselves as a multi project IT company and have never looked back since. Our CEO Mrs. Ishrat Akhter is a woman entrepreneur who is full of ideas and is constantly incubating ideas that have the potential to become huge. It is her vision that has given birth to ideas like www.civilserviceindia.com that is the leading online resource for IAS aspirants. Another educational portal that she promotes is www.coachingindians.com. Her experience in this area has helped Concern Infotech to create a hugely successful portal www.sociologyguide.com for one of our clients. Portals like www.thisismyindia.com and www.bhartiads.com have been her brainchild. Our recently launched Jokes app called Jokespedia is drawing a big fan base. A woman of multiple talents, she came to this industry not with a degree in engineering but with degrees in Literature and Sociology. 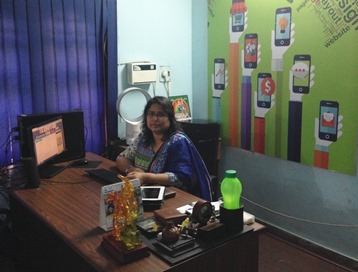 Armed with multiple IT courses, she started Concern Infotech Pvt. Ltd. and has been the driving force of this company. Her masters degree in Corporate Secretaryship was an added advantage. Her grit and determination helped keep the company alive, when the first dotcom crash happened and continues to keep it going through tough times. We are a combination of experienced and young dynamic web developers & professionals who focus on providing quality solutions to our clients. Our team consists of Web Designers, HTML Designers, Word Press Developers, Responsive Website Developers, PHP Programmers, Search Engine Analysts, Mobile Application Developers, Data Scientists and AI experts. We believe in team work. Great teams build great companies. Our Business Development Executives team understand the requirements of our clients through frequent communication and estimates the project complexity and gives a cost effective and innovative solution. We have continuously set industry benchmarks in terms of efficiency, consistency, quality and usability of our services. We've developed a unique brand value for creating Professional Websites. We are delighted to be a part of your business operations through our online web services and now AI services. Concern Infotech specializes in Web Designing Services like Responsive Web-Design layouts, Logo Design, Banner Designs for Social media and advertisements, Website Re-Design to upgrade your website to the latest trends and apps layout design or WordPress layout designs. Our design services also include Brochure Designing and Multimedia Presentations. The Web Development Services include Domain Booking, Website Hosting, Website Maintenance, E-Commerce solutions and Payment Gateway Systems. The Software Development services are Office Automation, Database Solutions, Content Management System and Enterprise Solutions. We are among the best Internet Marketing Companies in Chennai and our expertise in Internet Marketing includes Search Engine Optimization (SEO), Website Promotion and Social Media Marketing (SMO), Google Ad Words Campaign as well as Facebook and Twitter Promotions. As part of our App Development services, we do Apps for iOS and Android platforms. With your continued support we are now getting into AI or Artificial Intelligence. We are in the process of enhancing this team to suit the customers requirement. Our well qualified and dedicated team for design, development and marketing is here to serve in the most beneficial manner to you.